I was looking around at my pipe collection this morning and suddenly realized that I hate stem/shank enhancements of any kind. And weird shapes. Even Italian "classic" shapes look wrong. Have been in denial about this for years. Think I'd be better off sticking to Dunhills and other old Brits from now on. Basically that's where I live too. Plain and perfect. 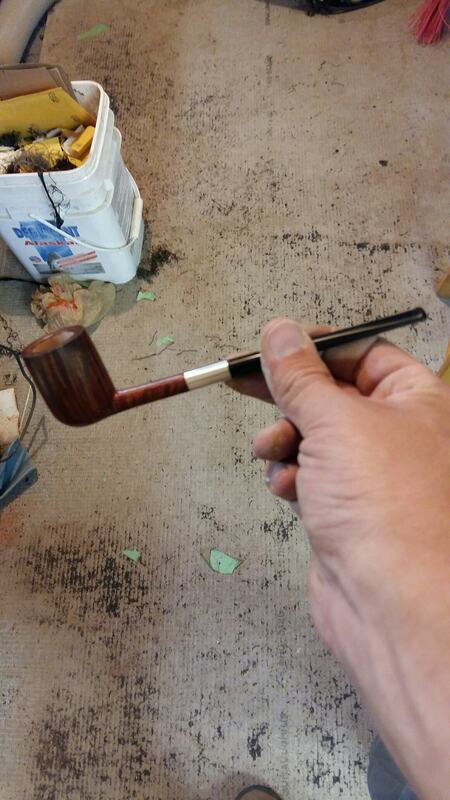 Most of the pipes I smoke are dressed down boring shapes and finishes, and most of what I make is the same. Give me wood and ebonite. The Italians I appreciate are Castellos more than any other brand, and even then, only 1/10 or so is a "hit" for me, I see a lot of bad/lazy shaping. Agreed, and those Castellos tick me off too. Close, sometimes, but no cigar. I'll keep you in mind. And let's not forget patina! Maybe I've watched too many '30s and '40s movies; nevertheless, there my pipesmokerly aesthetic sense lies. For the most part I'm with you, but I am a sucker for silver! Psssst... hey buddy.... wanna buy a pipe? I jest - actually I took this pic in the shop the day the pipe was done, took it to a pipe-club type thing that night, and it never came home with me. Fancy pipes sell, there's buyers for all kinds of stuff, but classics, done right, done tight... they ALL sell. Fancy pipes sell, there's buyers for all kinds of stuff, but classics, done right, done tight... they ALL sell. Truer words never spoken. Reversed-calabash-alier-snails-climbing-mount-Fuji-volcano-blowfish are certainly cool, but there are only a handful of guys willing to shell out that kind of dough for the art that it is. Thousands more just really want a decent pipe to burn tobacco in. I like them all, and offer no apologies for it. Different strokes for different folks. I'm an Italian pipe person. Pretty much have been from the beginning, though my first four pipes were all traditional British pipes. I do like swirly, marbled lucite, but that is the extent of it. I don't like bands, metal, horn, inlays, and all that nonsense. I have owned a few of these eyesores, but my attention instantly slam into all that crap and make me think, "Next!" Well, I suppose so if you don't look. The two artisans above, Jesse and Todd, among others here and there, are masters of their craft and quite capable of producing classics that are exquisite in their shapes. And they generally sell for less than, say, a Dunhill. My observation was merely a statement of personal preferences, not a condemnation of alternate aesthetics. I even like seeing divergent shapes and such, as long as they're in others' hands and not residing on my racks screwing everything up. Call me OCD, or anything else that fits. WHAT isn't a pipe? I think you are confused between freehand and handmade. Here's a handmade pipe that isn't a freehand. 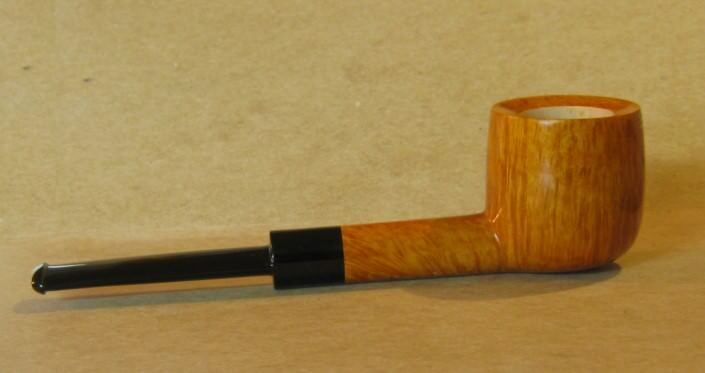 It's more or less a copy of a GBD pot, only the grain is crazy nice. What's not "pipe" about this? [quote="Sasquatch"]WHAT isn't a pipe? I think you are confused between freehand and handmade. THAT's not what I would call an ARTISON pipe. Guibleo d' Oro's are handmade pipes not ARTISON.as most that call themselves that. No confussion here . First of all Sasquatch that is an absolutely stunning rendition of a GBD pot, wow just wow! Second I won't involve myself in the artisan vs handmade debate. You can call your self and your products anything you like. As to the OP I completely agree 90% of my pipes are strictly classic British shapes with zero adornments. The other 10% are a mix of handmade/ artisan pipes and clay or meerschaum pipes. I don't have anything against off shapes or adornments but I never seem to buy them. To each their own. I like everything I own but if I had to live with just 3 makers, Becker, Radice and Ascorti would be my choices. That astonishes me. I've had two Ascortis and hated them both as smokers. Utterly lifeless pipes. Many years ago I was enamored with unusual shapes, "freehands" and the like. In fact, the more unusual, the better I liked it. With age that pretty much went away, and so did the pipes. I still have one or two that were special gifts that just can't be disposed of, but must admit they seldom come out of the rack. And I still have a few pipes that drift a bit - but not TOO far - from the traditional in terms of shank or bowl shape, etc. Beyond that, anything other than traditional shapes leave me completely cold. But I do like oval, square or diamond shanks, and as for stem/shank enhancements, well, a nice Peterson with a sterling band is one of God's gifts to pipe smokers . I'm on the fence with silver bands and whatnot. The fact that I tolerate a great degree of tarnish on them suggests that I'm not too enamored of them. I love good silverwork, but not necessarily on a pipe. It's kind of like tattoos: I've seen some great tattoos, as art. But do I want that embedded permanently on my hide? Nawww, I think not. I do believe I'll try putting all my banded pipes together on a rack--isolate them, in effect-- and see how that sits with what I'm now starting to regard as a neurosis.